Fort Bragg has had a long history in the course of my life-time. 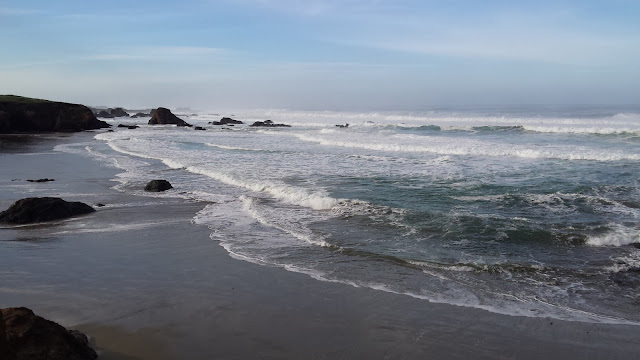 My first visit to Fort Bragg was when my high school academic decathlon team and I vacationed there during my senior year. Earlier this year I asked my fiancee to marry me there and now we're back for my father-in-law's birthday. It's a small quaint town but a great one. I love surf fishing. It's so fun. Surf fishing is a great way to spend the day at the beach while the missus entertains herself on the beach. 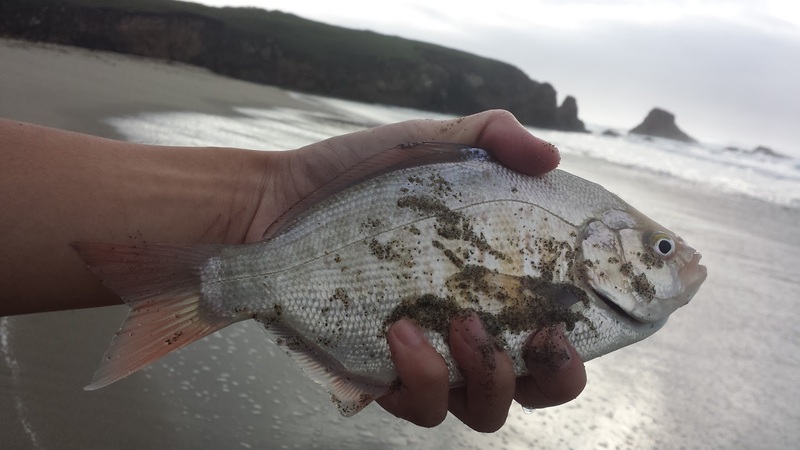 Fort Bragg has quite a few decent beaches to surf fish but the last time I was there the fishing was tough on the fly. The gear I was using wasn't quite up to the task so I didn't have much luck. I could've brought my fly rod with me this time lined with a heavier integrated sinking tip but because this trip was meant for my father-in-law I opted for a spinning rod instead. Me? With a spinning rod?! It's been so long since I've cast a spinning rod that I was actually looking forward to it; plus I was looking to fill up the cooler. After getting into fly fishing I've since sold all my gear stuff but my fiancee still had a spinning outfit. A 6ft black and pink medium action Shakespeare rod with an Abu Garcia Cardinal reel. Very manly and it will do just fine. My fiancee and I traveled on Friday and on Saturday we spent the majority of day with the in-laws at Glass Beach. The stairs to Glass Beach #1 have been removed due to possible erosion so if you plan on visiting make sure you're ready for some impromptu off-trailing. Beautiful beach as always. Once we finished our visit there we had lunch at the Sea Pal Cove and stopped at the bait shop around the corner. I picked up some Gulp Sandworms, swivels, and bait hooks. It was fishing time. 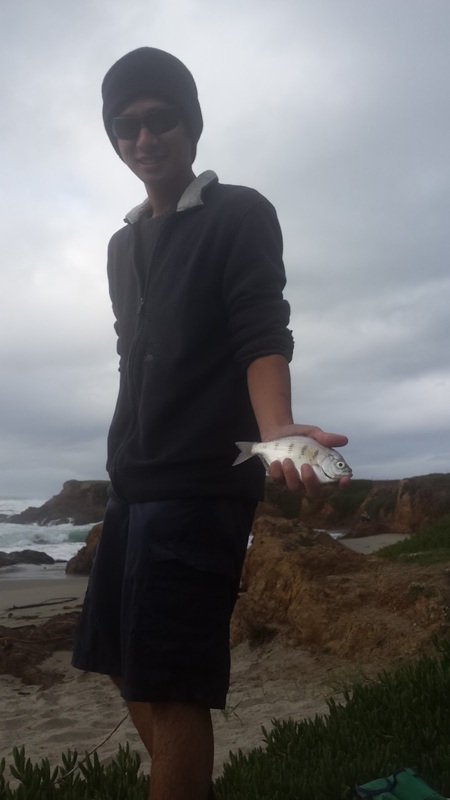 We visited a nearby beach and while my fiancee went to off to lay down in the sun, I went fishing. The surf wasn't too rough despite an small incoming storm. 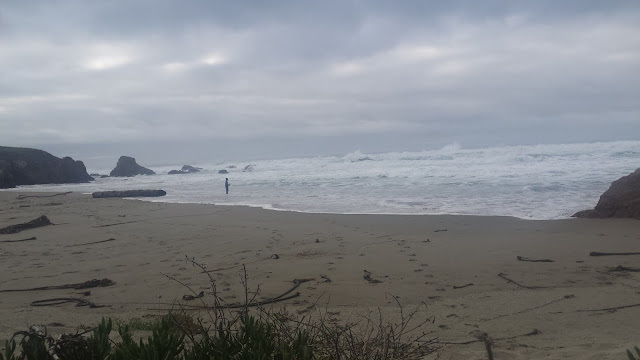 Just be cautious and careful when in the surf zone. 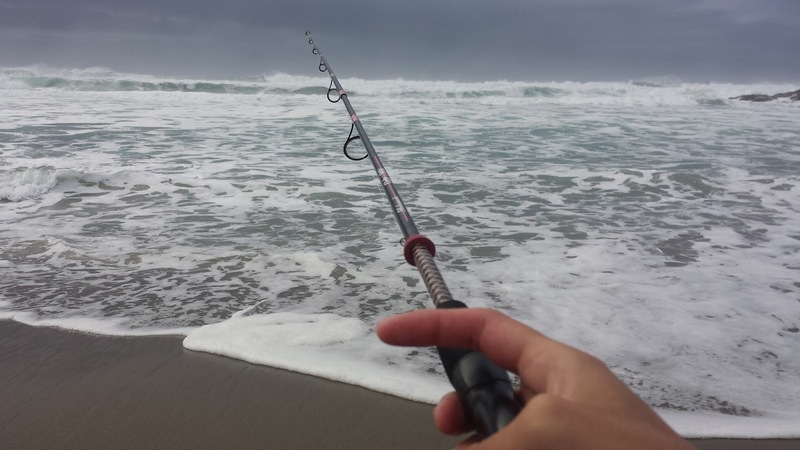 I have to admit that gear fishing the surf is immensely easier than trying to fly fish it. After a few minutes of casting I hooked my very first silver surf perch. It didn't take too long to figure out what was working and after catching a bunch of silvers and a few redtails I picked up eight silvers for the freezer while releasing the smaller ones. The red-tails also make great table-fare but they had to be at least 10.5'' and since I didn't have a tape measure handy I just threw them back. My fiancee, father-in-law, and a group of drunks cheered me on as I continuously pulled fish out. It was a great trip. Great company, great food, and great weather. I had a lot of fun on the surf with the spinning rod; as a matter of fact, so much fun that I'm now looking into getting a spinning rod of my own.